High school student Aoi Mashiro has recently started working at Kura, an elegant antique shop located in Kyoto’s Teramachi Sanjou district. 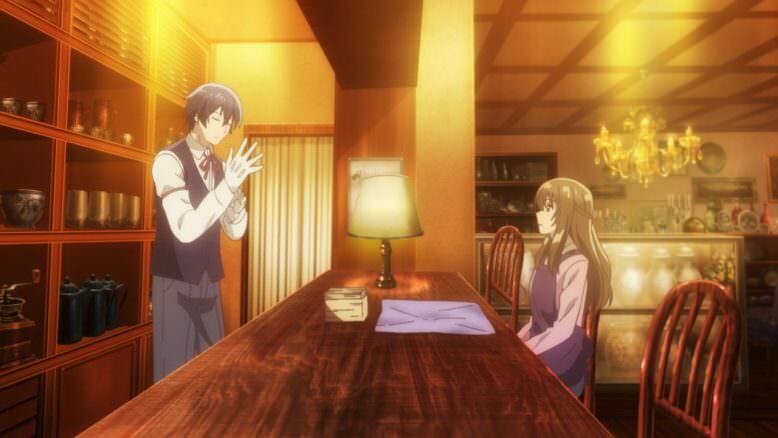 Alongside her cleaning and organizing duties, she learns all about antiques from Kiyotaka Yagashira, the handsome and refined grandson of the store’s owner Seiji Yagashira. Because his grandfather is always traveling and his father, Takeshi Yagashira, is a successful – and busy – author, Kiyotaka is usually left in charge of the store. However, that’s not his only job – he also solves various mysteries and problems for the people of Kyoto, earning him the nickname “Holmes”. In the first part of the episode, Holmes confronts a counterfeiter who deliberately brought him a fake item, hoping to trick the “young and inexperienced” antique appraiser. This causes Aoi to remember her first meeting with Holmes, when he correctly deduced a lot of information about her in a short amount of time (similar to Sherlock Holmes, hence the nickname.) She had brought him some valuable paintings by a Zen master named Hakuin, but Holmes refused to buy them because he realized that they belonged to her family and were not hers to sell. The antique shop is so lovely. it really looks like a place I’d like to visit. Overcome, Aoi explains to Holmes that she wanted to buy a train ticket back to her former home, Saitama, to confront her ex-boyfriend and former close friend whom he is now dating. In response, Holmes tells her a story about Hakuin and the acceptance and love he felt for those around him even during difficult, painful times. Holmes, in turn, is impressed by Aoi’s honesty and eye for genuine antiques and offers her a job to help her earn the money for a train ticket. 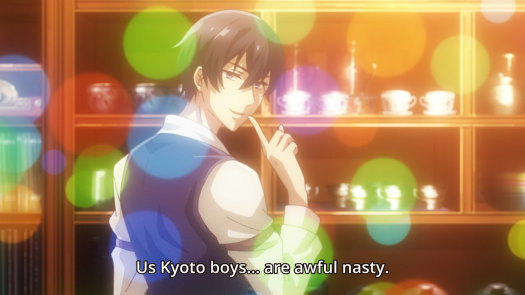 However, Aoi’s desire to confront her ex-boyfriend may be decreasing, as she seems to be falling for both Holmes’ gentlemanly nature and his hidden “bad Kyoto boy” side. At the very end of the episode, a potential overarching plot is established as the counterfeiter’s boss becomes infuriated that an inexperienced appraiser like Holmes was able to put a stop to his plans. I’d been hoping for a show with a nice relaxing atmosphere this season, and Kyoto Teramachi Sanjou no Holmes is definitely it. 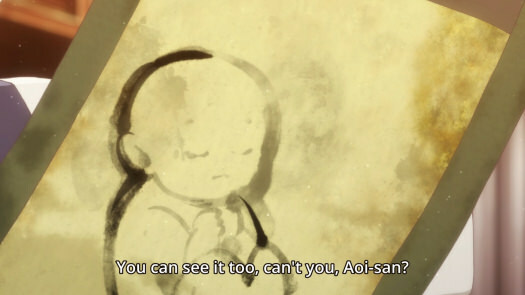 A slow-paced show focused on character interactions set in a beautifully designed antique shop, set to a score of soft, gentle instrumental music? Sign me up! Unfortunately, I do feel as though this first episode was perhaps a little TOO slow paced. I was interested in Holmes because it advertised itself as a mystery show, which is one of my all time favorite genres, but this episode did not really have any mysteries at all. It focused on the initial encounter between Holmes and Aoi, which was pretty sweet, and did potentially set up a longer plot thread with the counterfeiters, but I still wouldn’t really call it much of a mystery so far. I think a lot of people will probably be turned off this show simply because of just how little happened. This is Holmes’ grandfather. Hopefully in the future, he’ll be more than just an “old man comic relief” type character. Still, it wasn’t without its good parts. I’ve already mentioned the music, but I definitely think it was a high point – mostly soft instrumental with a relaxing tone. The design and animation of the antique shop itself is pretty good, although the character animation did look a little wonky in parts; I found this disappointing because it already wasn’t a huge action/movement focused episodes. 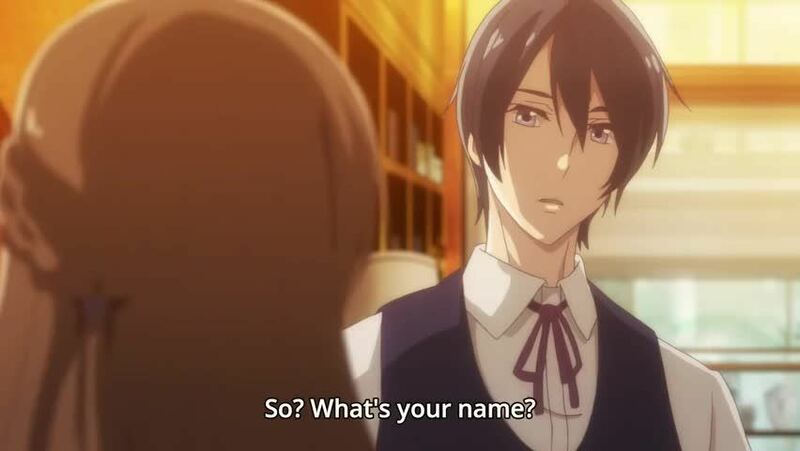 Holmes giving Aoi information about the different types of antiques was interesting and pretty informative, especially since he structured his “lessons” in a way so as to be accessible to beginners. I know absolutely nothing about antiques, but I honestly felt like I learned at least a little bit from this episode! I think there was a little TOO much explanation, although that could be explained as it being the first episode and focused on setting introduction – it’s very possible that Holmes’ “Mr. Exposition” moments might get toned down as the plot picks up. Overall, it was a relaxing and pleasant to watch but a little too slow-paced. 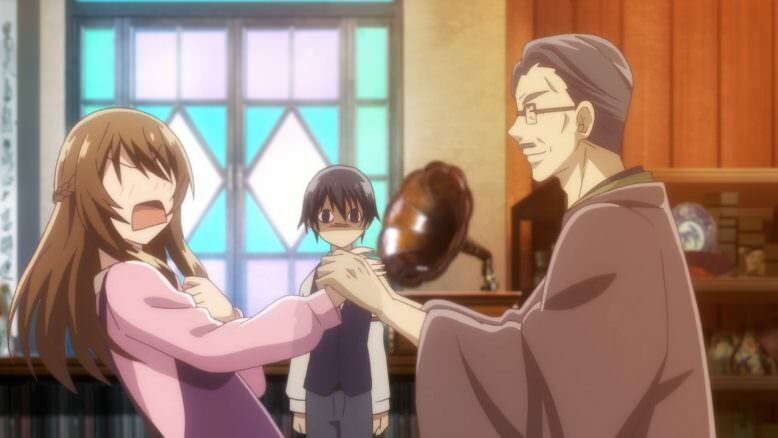 However, I have enough hope that it will pick up in future episodes that I will give Kyoto Holmes at least one more episode before making a final judgment one way or another. If it DOES turn into more of a mystery show, especially if it’s an episodic one or focused on lots of short case arcs, I could easily see myself choosing to blog this offering.